SAMSUNG GALAXY S10 VS S10 PLUS VS S10E: WHICH SAMSUNG FLAGSHIP WILL SUIT YOUR NEEDS? Update: we've updated this article with more details so you can get an even clearer picture of how this trio compares. The Samsung Galaxy S10, Galaxy S10 Plus and Galaxy S10e are here, but how do they stack up? The S10 and S10 Plus are upgrades over the respective Galaxy S9 handsets, while the S10e is the ‘budget’ device of the trio – there was no similar S9 device (we did, however, see a Galaxy S8 Lite). As these are flagship devices from one of the biggest brands in the smartphone business, they’re all sure to be great phones, but we’re here to help you decide which of the three is best suited to your needs – and your budget. Here, we’ll run through the S10 trio to help you decide which should be your next smartphone: the Galaxy S10, S10 Plus, or S10e. The key difference between the devices is their size – both the screen size and the overall dimensions. As the name suggests, the Galaxy S10 Plus is a little bigger than the other devices, whereas the Galaxy S10e is a rather petite handset. The S10e measures 142.2 x 69.9 x 7.9mm and weighs 150g – it’s a slender device that will easily fit in your pocket. It has a 5.8-inch AMOLED screen, which is a little small compared to other flagship devices, but nothing to turn your nose up at. The next device up is the Galaxy S10, which is a little larger at 149.9 x 70.4 x 7.8mm and tips the scales at 157g – so other than its length it’s not much bigger than the S10e, and is actually thinner, and it’s barely any heavier. Despite not being that much bigger overall it has a noticeably larger AMOLED screen at 6.1 inches. The big boy of the bunch is the Galaxy S10 Plus, which measures 157.6 x 74.1 x 7.8mm and has a bigger 6.4-inch screen. Even more apparent than the difference in size is the weight difference – at 175g it’s quite the bulky device. This added heft is, of course, down to the higher spec, particularly the more advanced camera and bigger batteries, both of which we’ll get to later on, but if you’re a fan of dainty devices you may find the Plus a bit too Plus-y. Note that the Galaxy S10e as well as being the smallest at 5.8 inches also has a lower resolution screen than its siblings, at 1080 x 2280, rather than 1440 x 3040. It's flat too, rather than curved, and the bezels are slightly larger. There’s a clear progression with regards to the camera on the Galaxy S10 devices: with each better phone, you get an extra lens. The Galaxy S10e comes with a 16MP ultra-wide lens and 12MP optically stabilized variable aperture lens on the rear of the device, and a dual-pixel 10MP camera on the front. Given this is the ‘budget’ handset of the range, a dual-lens rear setup and powerful front camera is a pretty great deal. On the Galaxy S10, you get all of the above, with an extra 12MP telephoto lens on the rear, and when you step up to the Galaxy S10 Plus you get a second, 8MP, front-facing camera. That’s five lenses split between the front and rear for the S10 Plus which, as you'll see in our review, deliver some pretty amazing photos. If it’s the absolute best camera experience you’re after then, we’d have no hesitation in recommending the Galaxy S10 Plus as the phone to go for – although any of these devices will deliver some pretty great pictures. As with the camera, the higher up the S10 range you go, the better the battery you get. The Galaxy S10e comes with a 3,100mAh battery, the S10 is packing 3,400mAh, while there’s a whopping 4,100mAh power pack in the Galaxy S10 Plus. Across the S10 range these capacities are slightly better than competing phones – compared to the S10 Plus’s 4,100mAh, for example, the iPhone XS Max’s 3,174mAh and Pixel 3 XL’s 3,430mAh look relatively puny. Each of the devices comes with wireless charging and wireless power sharing, enabling you to use your handset to charge another Galaxy device. Each of the Galaxy S10 trio comes with either the Snapdragon 855 or Eynos 9820 chipset. Those are both top-end and the split isn't by model but rather region - in the US you'll get the Snapdragon 855 while in most other places it will be the Exynos 9820. There are different memory sizes for each variant, so you’ve got plenty of choice here – if you can get your head around the various options. The Galaxy S10e is available with either 6GB of RAM and 128GB of internal memory, or 8GB and 256GB. The Galaxy S10 comes in 8GB/128GB and 8GB/512GB variants, while the Galaxy S10 Plus has 8GB/128GB, 8GB/512GB and 12GB/1TB options. Each device also has a microSD card slot which supports cards of up to 512GB. The Samsung Galaxy S10e is the most affordable of the trio at $749 / £669 / AU$1,199 for the 6GB/128GB option. Compared to the iPhone XR, which costs $799 / £799 / AU$1,299 with the same amount of memory, it represents a decent saving, particularly if you’re buying the phone in the UK. It’s then quite a step up to the Samsung Galaxy S10, which costs $899 / £799 / AU$1,349 for the 8GB/128GB model. That’s exactly the same price the 128GB Google Pixel 3, another competing device, launched for. The 8GB/512GB version, meanwhile, costs $1,149 / £999 / AU$1,699. Not surprisingly the Galaxy S10 Plus is also plus-sized when it comes to its price tag. The cheapest option is 8GB/128GB, which costs $999 / £899 / AU$1,499; if you want more storage you’ll have to shell out $1,249 / £1,099 / AU$1,849 for the 512GB handset, or $1,599 / £1,399 / AU$2,399 for the top-of-the-range 1TB model. The best Samsung Galaxy S10 device for you depends wholly on your budget. If you want all the benefits of the S10 range without breaking the bank, the Galaxy S10e is your best option. Despite its lower price tag it still has the same sleek design and quick processing as its bigger siblings, and even has a pretty powerful battery and camera too. The core of the range is the Galaxy S10, with all the features you need in a phone. It's a little more expensive, but for this price you get a flagship device that's better than most and sure to last you a long time. 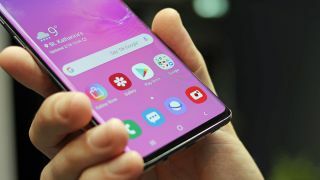 If money is no issue, however, you might want to upgrade all the way to the Samsung Galaxy S10 Plus. Its bigger screen, massive battery and crazy number of cameras make it a luxury item that will let you indulge in all your video-watching, game-playing, photo-taking needs.